As they say, “location, location, location.” In this case, it makes all the difference for what is essentially a sheet of clear plastic. 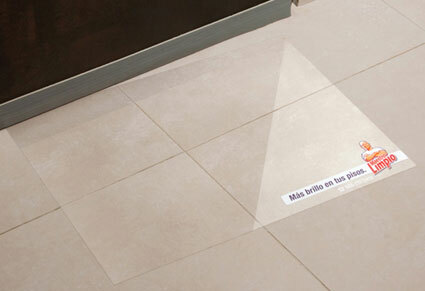 This clever promo is designed to be slipped under the door to show you how shiny your floors would be if you used Maestro Limpio. (That’s Mr. Clean to you.) For some related ideas we’ve featured in the past, check out this clever door-based promo, and this promo that is basically just a flat piece of plastic, but still rocks.